UANYC was among the more than 3,500 teams and 45,000 participants. NEW YORK -- Once again, the Greater New York Chapter hit the streets for a good cause. 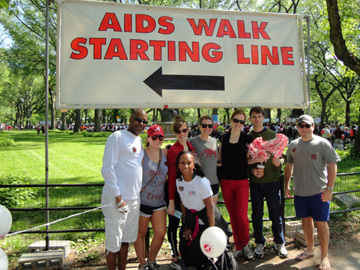 For the second year in a row, UANYC's Crimson Tide Coalition to Fight AIDS team participated in AIDS Walk New York. The chapter's 10-person team raised $600 and made the 6.2-mile walk through Central Park in support of the 27th annual event that benefits the GMHC and more than 40 other AIDS service organizations in the tri-state area. Participating in AIDS Walk New York 2012 were Blake Brunson, Caroline Cooney, Roxanne Ducas, Richard Ferrucci, Suzanne Flanagan, Rodrigo Flores, Christopher Hollinger, Rebecca Mummert, Valenica Porter and Hunter Uzelac. Porter serves as UANYC's Community Service Chair and coordinated the chapter's participation in the event. Also contributing to the chapter's fundraising efforts were Jeff Adams and Scottie Rodgers.